I first designed and built this site for them in 2013 and it was time to freshen things up a bit. They came to me with a lighter, brighter color palette and a new logo, and were looking for a simple design update that would have the largest visual impact for the smallest budgetary impact. A fun challenge! With just a few tweaks to the CSS files, I updated the colors and made the home page slideshow stretch all the way across the screen to modernize the look. We also decided to add caption overlays to the slides so they could serve as calls-to-action in addition to simply looking pretty. 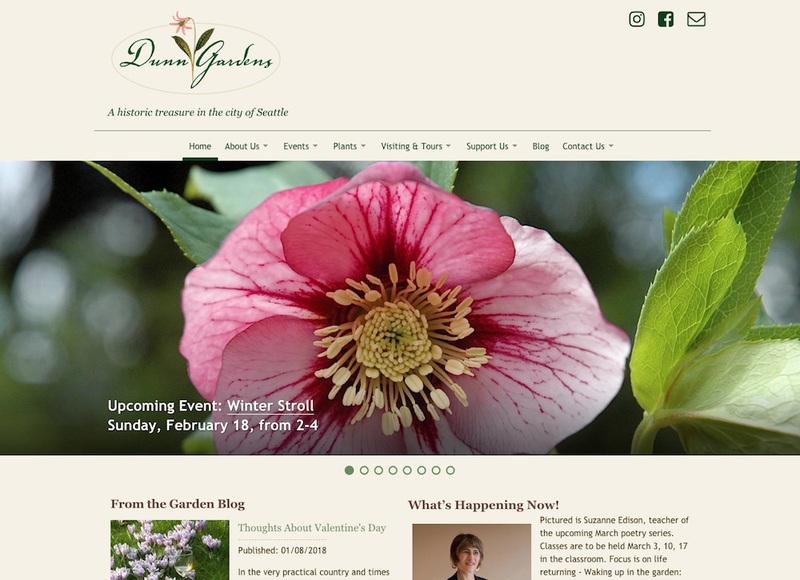 Behind the scenes, the Gardens are a long-term client: I’ve been working with them to evolve the site’s functionality to meet their changing needs. We’ve added private pages and calendars for docents and board members to share information, and we’ve streamlined the very simple event ticketing system. This has been a fruitful collaboration, if you don’t mind the pun!